Bucketlisters and speedy travelers shooting through Peru often spend half a day in Nazca, do a quick flight over the Nazca Lines, and hightail it on to Arequipa, Cusco or Lima. GIGANTIC MISTAKE. 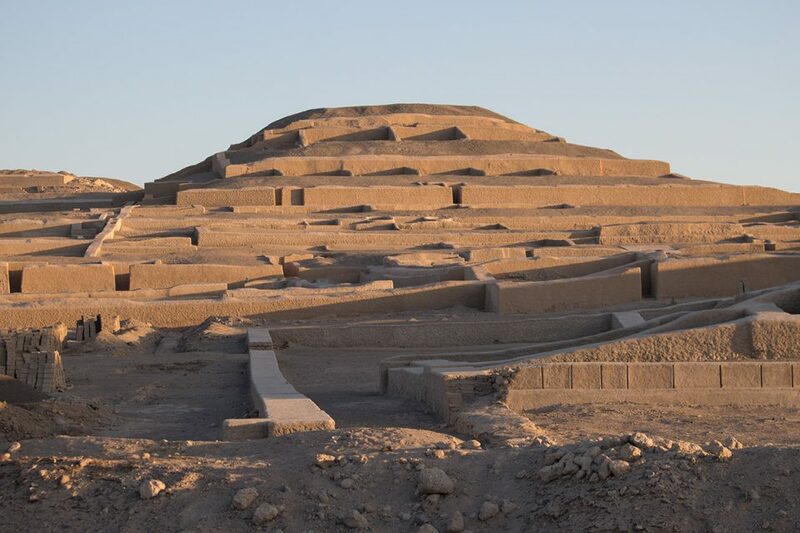 Nazca is a fascinating region which deserves far more attention. Thomas and I spent six days here, and this is just a bit of what we discovered. 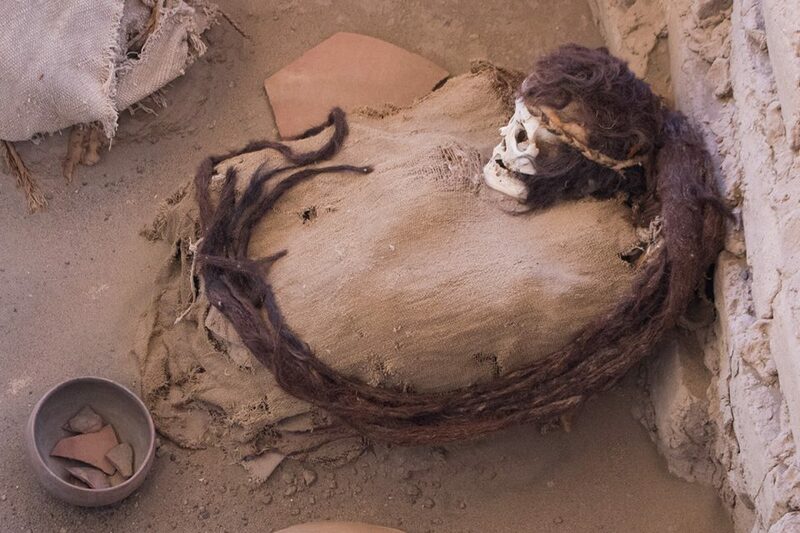 The Chauchilla Cemetery, a 1,000-year-old burial ground located about 30 km south of Nazca, is NOT to be missed. Visitors are greeted with open-air tombs of shockingly well preserved mummies, eerie and extraordinary messengers from late-era Nazca culture. Clothing and hairstyles reveal intriguing cultural details which bring the ancient civilization to life. 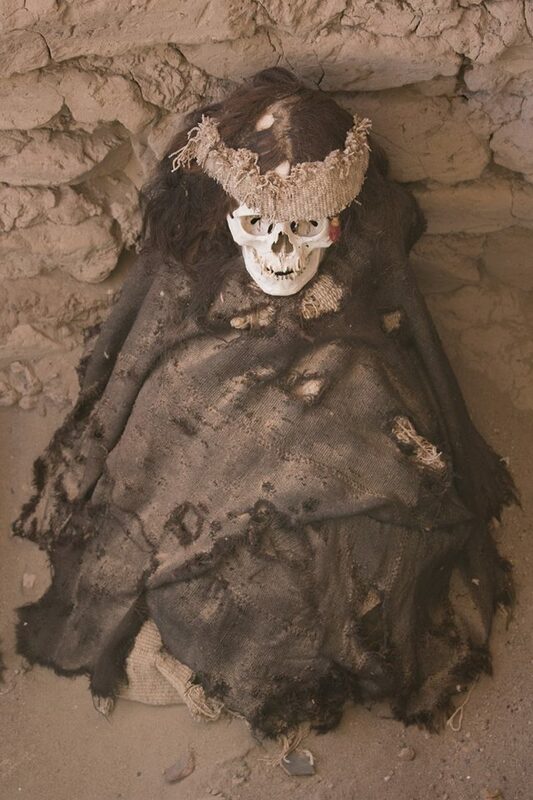 Don’t miss the mummified shamans sporting long dreaded manes of hair. And keep your eyes peeled for mummified babies with bound heads. Examine the incredibly preserved textiles closely to discover ancient patterns and original natural colors. Some mummies miraculously still have dry, leathery skin on their faces. As you walk around the site, notice the human bones, ceramics and textiles scattered by site looters emerging from the dirt. Bizarre, sad, incredible. 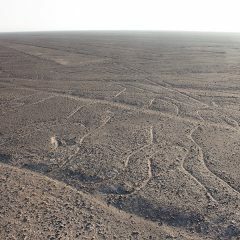 The Nazca culture produced an elaborate system of underground aqueducts called puquios throughout the Nazca Valley. Most of the puquios are still functioning today and are even used to irrigate modern fields. Cantalloc and Ocongalla are two sections of the puquios that are of special interest to visitors. 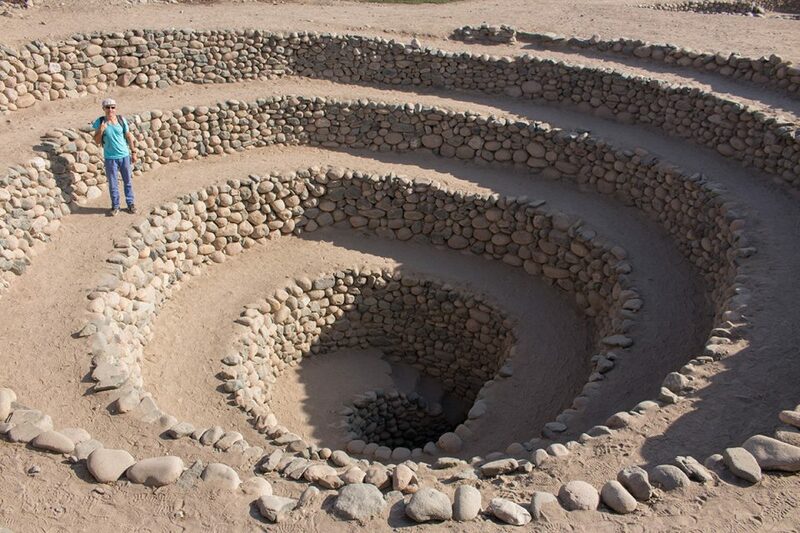 Cantalloc, within walking distance of Nazca, is an intriguing collection of spiral access points to the aqueducts, which are quite beautiful and photogenic. Ocongalla, which is easily combined with a trip to Cahuachi, is a more abstract collection of stone terraces surrounding an open stretch of aqueduct. Some believe the site was used for ritual purposes. Yes, Nazca is much more than lines, but they remain the superstars. 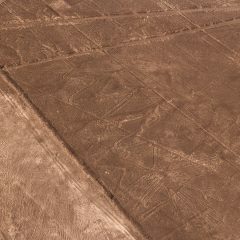 Leading theories suggest that the Nazca Lines served a religious or ritual purpose and alignments between the lines, key stars, and significant ritual points throughout the valley have been observed. Others believe, the lines, figures and the unexplained “landing strips” are proof of ancient ties to UFOs. 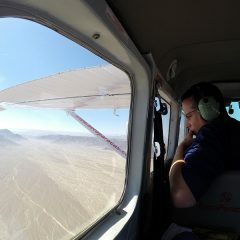 View our gallery of our Nazca Lines flight and judge for yourself. In any other country, Cahuachi would be a household name. In Peru, a nation overwhelmed with spectacular ruins, it barely registers as a blip on the tourist radar. When we visited the isolated site, we virtually had the ruined buildings and pyramids to ourselves. While visiting, notice the fascinating use of differently shaped adobe bricks. A good guide will also point out the food storage nooks and the extraordinary underground cisterns, which have fired walls like huge underearth pots. Don’t miss the horizen of unexcavated pyramids behind the present site. Insane!!! 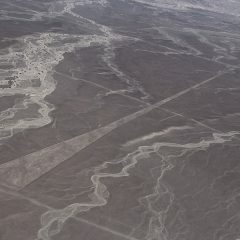 While the Nazca Lines are well known around the world, very few people have heard of the Palpa Lines. 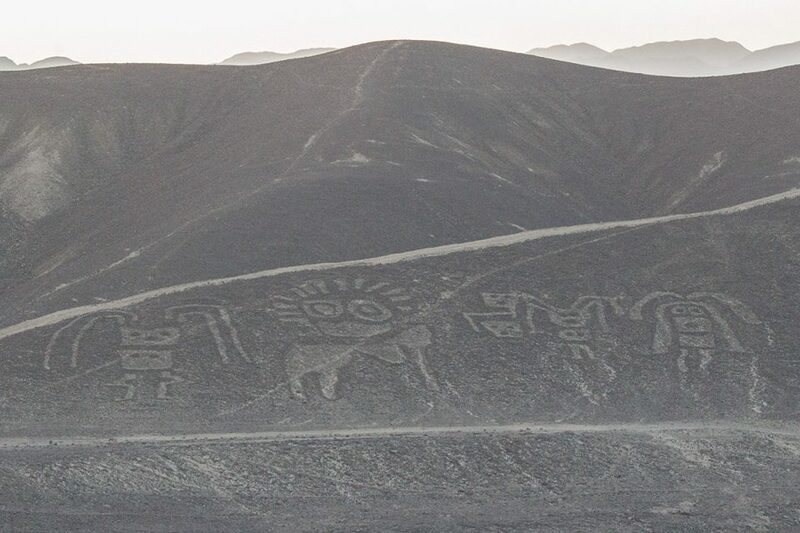 Located 50 km north of Nazca, many of the Palpa Lines and hill figures are actually quite stylistically different from those on the Nazca plain. The hill figures almost look like stick cartoon characters experiencing a major bad hair day. And the mandala-like Sun Star should send the hearts of conspiracy theorists everywhere racing. Lot’s of mysteries here. Will some expert please gift the world with a well documented Wikipedia article on the Palpa Lines? 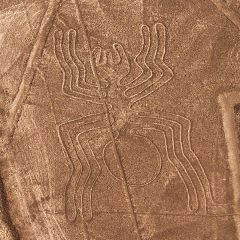 For now, you can read UNESCO’s short synthesis of the Palpa Lines, the Nazca Lines, and the geoglyphs in the coastal plains. As if Nazca didn’t already have enough in terms of cultural attractions, it also boasts the Cerro Blanco, “the world’s largest sand dune.” If you follow us, you know I’m usually quite skeptical about superlatives; however, in this case, I might make an exception. At a whopping 2,078 m (6,817 ft), we can’t think of anything that comes close. (Sorry Namibia, Algeria, Morocco and China, but technicalities aside, this monster is really impressive.) The dune is easily visible from much of the Nazca Valley and you can even climb it if you’re a masochist. 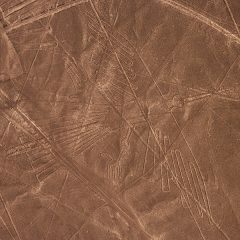 Also, if you do a Nazca Lines flight, keep your camera ready during take off and landing for great shots of the Cerro Blanco. 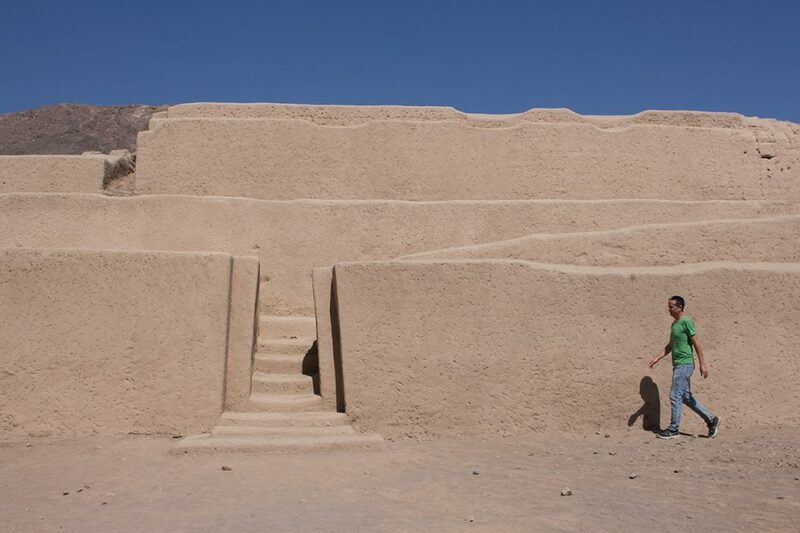 You can also walk to the Paredones ruins located just outside Nazca. This is a MUCH smaller site than Cahuachi and you can easily see everything in ten minutes. That said, there were some strangely appealing and photogenic moments including these surreal adobe walls and door. There’s a certain Georgia O’Keeffe appeal to the site. It can also be combined quite easily with the Buena Fe geoglyphs and even the Cantalloc aqueducts. The deserts around Nazca are filled with burial sites, many of which have unfortunately been looted. Look for remnants of these looted sites as you visit other attractions. On our way to Cahuachi, we stopped in the middle of nowhere and simply took in the vastness of Peru’s historical legacy. As far as we could see, fields of human bones, pottery, and textiles sat unguarded. 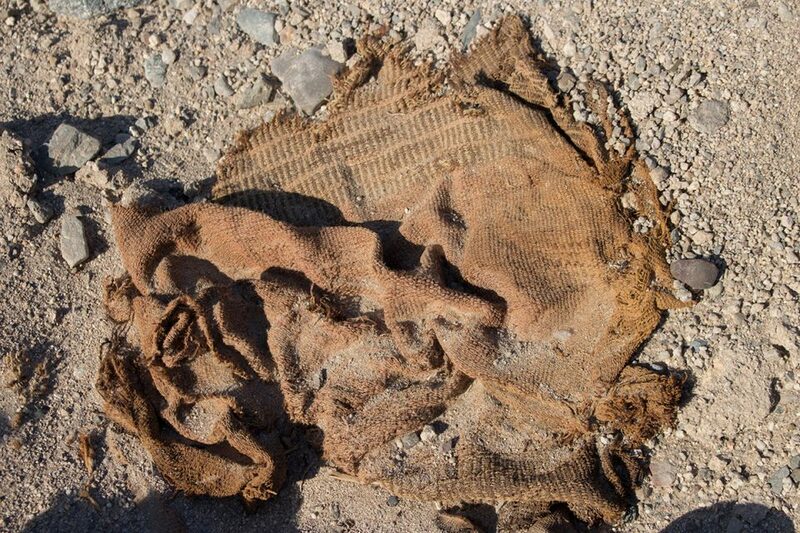 Entire cloaks, human legs, spines, fluffy llama wool, heads… was that an entire mummy? The historical richness is beyond impressive; the degree to which the Peruvian government is neglecting its history is tragic. Locals recognize and openly talk about this neglect. Ask as many questions as you want. 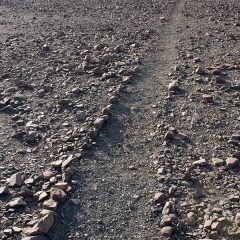 When to Go – Best time to visit the coastal plains around Nazca is December through April when days are hot and dry. Outside this time period, much of the coast – including Lima – is under a blanket of gray mist called garúa. Having said that, May through November is the peak season for the Peruvian highlands and the Amazon, so it’s a bit tricky to hit the perfect weather for all attractions on a single trip. We actually went in July, and it was fine. 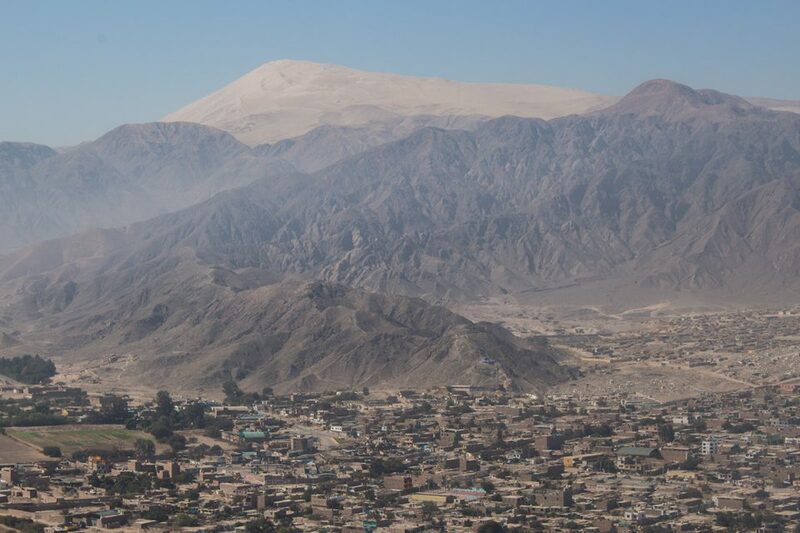 Accommodation – The town of Nazca is very pleasant, and is a wonderful base for exploring the surrounding coastal area. It also has plenty of accommodation options for every budget. We recommend searching for Nazca hotels at HotelsCombined.com, a site which finds the best deals for you across numerous top hotel booking sites. 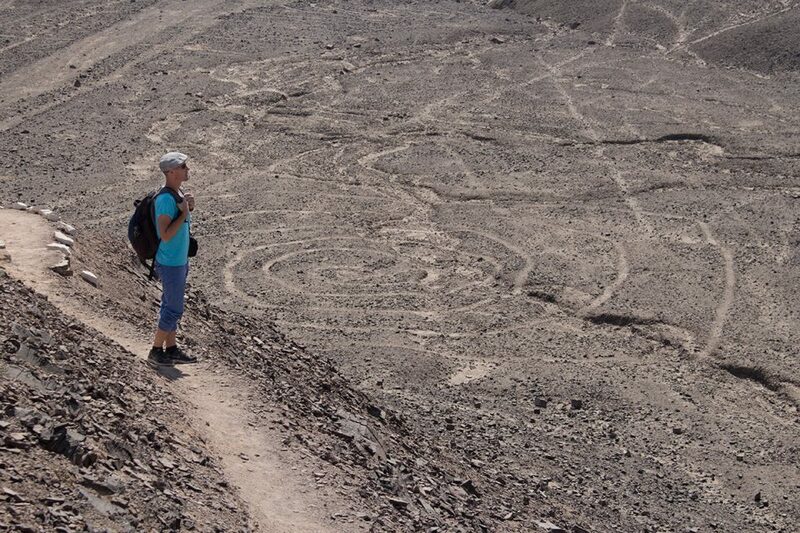 Tours – Tours to the sites around Nazca can be organized through hotels and lodges in town. A few of the sites are walkable, but most of them are further out in the desert and require transportation. We took a tour to the Palpa Lines, which also stopped at an elevated Nazca Lines viewpoint on the way back to town. 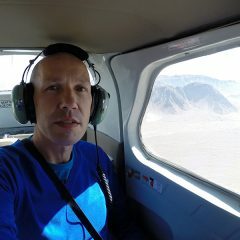 If you want to book your tours in advance, check out Viator’s Nazca tours. But if you prefer to shop tours locally, bargain hard. Nazca is not a place where you necessarily get what you pay for. Tour passengers are often grouped with passengers from other companies. It can be frustrating to discover the person next to you in the van paid half the price. 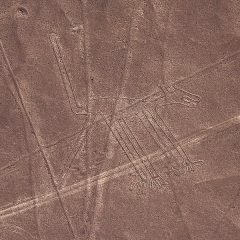 Nazca Lines Flight – Flights are similarly complicated. Prices are all over the place depending on where you book tickets and which company you choose. We had an excellent experience with Aeroparacas. 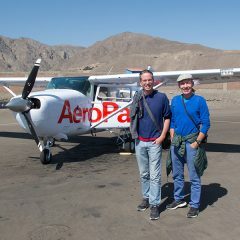 Their pilots were very professional, they always did a double fly-by (one for each side of the plane), and we were in smaller 6-person planes, which made viewing the Nazca Lines much better. If you are in larger planes, you can only see out of your window. In smaller planes, you can easily see out of both sides of the plane. 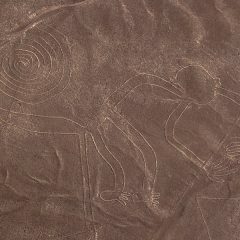 Again, shop around to get the best price for your Nazca Lines flight. Sometimes, booking through the airlines directly (either locally or online) can be cheaper than booking through an agent. It’s definitely worth checking both options. 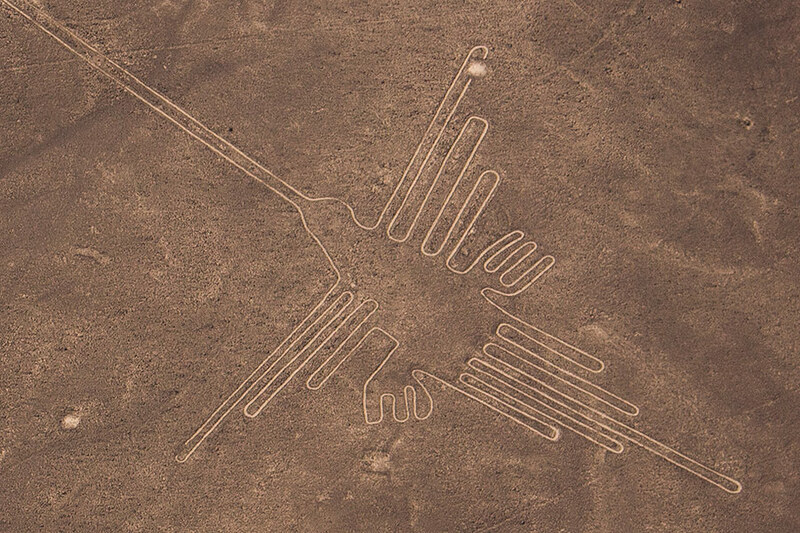 In December 2014, news broke that the famous Nazca hummingbird, the lead picture in our Nazca Lines post, was damaged by Greenpeace activists during an environmental publicity stunt. We are including a 6-minute PBS report detailing the nature of the publicity stunt and the damage caused by the activists. The report includes drone footage of the damage to the site. We spent a few days in Nazca last year and totally agree that while the lines are the main stars, there is still a lot more to the town. In the end, we didn’t take a flight over the lines (the cost, the safety records and the turbulence put us off) but we did visit the museum before going out to see them from a viewing platform, and I got so much more out of that little glimpse from educating myself beforehand! @Sam, Actually, we heard that there have been huge changes in the way flights are being conducted and that the safety record is much better. 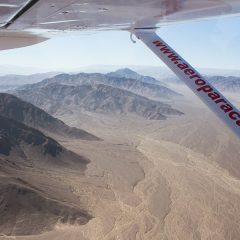 The pilots for Aero Paracas felt really professional and I wasn’t worried at all during the flight. I think it was really worth the cost, but to be fair, I think I wanted to see Nazca more than Machu Picchu. Coolio. 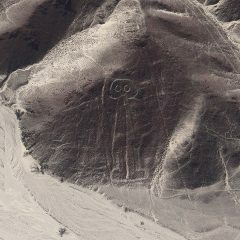 Have you heard of/been to the geoglyphs in Blythe, CA? I see an expedition in our futures next time we’re all in Sandy Eggo together. @Laurelle, Wow!!! That is so cool. I really want to do this with you guys. Did you hear about what Green Peace just did in Nazca? 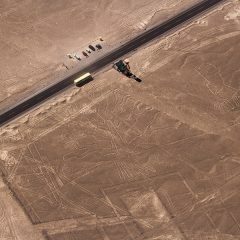 @Jessie, Not only did we hear about Greenpeace’s STUPID publicity stunt at Nazca, but our lead picture in this post was the very geoglyph they damaged. 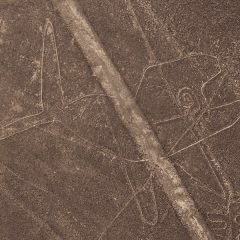 The famous Nazca hummingbird was one of the best preserved and most photographed of the Nazca lines. I don’t know what they were thinking. We have embedded a PBS video in our post above discussing the Greenpeace stunt and showing drone footage of the damage. I cannot believe the damage they did. This is a tragedy, a crime. I had no idea there was so much to do in nazca. I wish I had spent more time there. The Greenpeace thing is so sad. Thanks for posting the video. The damage was worse than I thought.